Yet, plenty of shops don’t have a solid process for handling their receiving duties and that cascades down into poor inventory control too. When it’s faster to order another set of shirts than try to find the ones that “should be here”, that’s when you know you have a problem. Do you have boxes and boxes or even skids of t-shirts from a year or more laying around? It’s a big problem. And mostly, the bigger the shop, the bigger the problem. Somehow a magic wand blesses the shirts as they come in, and then the missing or wrong pieces aren’t discovered until they are at the press…or worse, printed. That’s when you have to make that phone call to the customer. “Wait, you are telling me this NOW?! !”, they exclaim. So let’s take a quick look at some inventory receiving best practices. First, you have to assume that there is a problem. Your job is to find it. Percentage-wise, the inventory, and goods that you receive on a daily basis are fairly accurate. However, that’s where our old nemesis, Murphy’s Law comes into play The challenges seem to show up when there is a critical event, important customer, or worst timing. What I know is that it’s best to just think that everything that is dropped off has some sort of problem. Like the famed cartoon book image hunt, “Where’s Waldo”, the challenge is to find the problem. Therefore, start with the mentality that you are always looking for what’s wrong. My good friend Mark Coudray advises for processes to be built using the acronym, CPR, which stands for Consistent, Predictable, and Repeatable. When I first heard that from him, I thought it was the best way to think about constructing any process for the shop. What you want is a systemized way of doing it. Not how Sally does it. But how the shop should do it. It should be your shop “Way”. This becomes teachable and you can hold people accountable if they don’t do it correctly. Means you are doing it the same way absolutely every time. Means that there should be clear expectations of what the outcome should be. It’s always the same results. You can literally bank on it. Means that it is not a one-off variation. Your shop repeats the same process, even with new people helping out. Therefore in your shop, do you have a CPR way of handling incoming inventory and goods? Is everyone doing it the same way? In some shops I’ve visited, only one person knows how to do it and it’s “their” way of organizing it. They don’t teach it to other people, and frankly, it becomes some sort of job security thing for them. Don’t get held hostage. You hear the beep, beep, beep of the UPS, FedEx or other delivery truck backing up to your dock or door where you receive your goods. Is your area clutter-free an ready to go? Are tables or skids lined up empty so you can segregate the incoming packages? You want to quickly and easily be able to organize any stock that is on the way into your company. One quick way to do this is by having skids lined up so that all of the boxes that are for orders that only have one box, go on that skid. Orders that have two boxes go on another skid. Jobs with three boxes are on a third skid. And so forth. Another great practice is to use a thick marker and write the Purchase Order number from the packing slip on the outside of the box or package in large easy-to-read-from-five-feet-away numbers. Both of these organizational steps allow you to quickly cycle through the incoming boxes. If you need to look for that “hot” order, it’s much easier to find. Make sure you count the packages before the driver zooms off. If you are to receive 63 boxes, there better be 63 boxes on your dock. Remember, you just signed for them. If there is only 61, have them hunt through the rest of the stuff on the truck and locate the missing items. The next step is fairly obvious, checking everything in. First, start with those “hot” orders. Get them reviewed first. Start with the packing slip for the box. Depending on the vendor this could be a sticker on the box, or it could be a paper slip in a clear envelope stuck to the box. 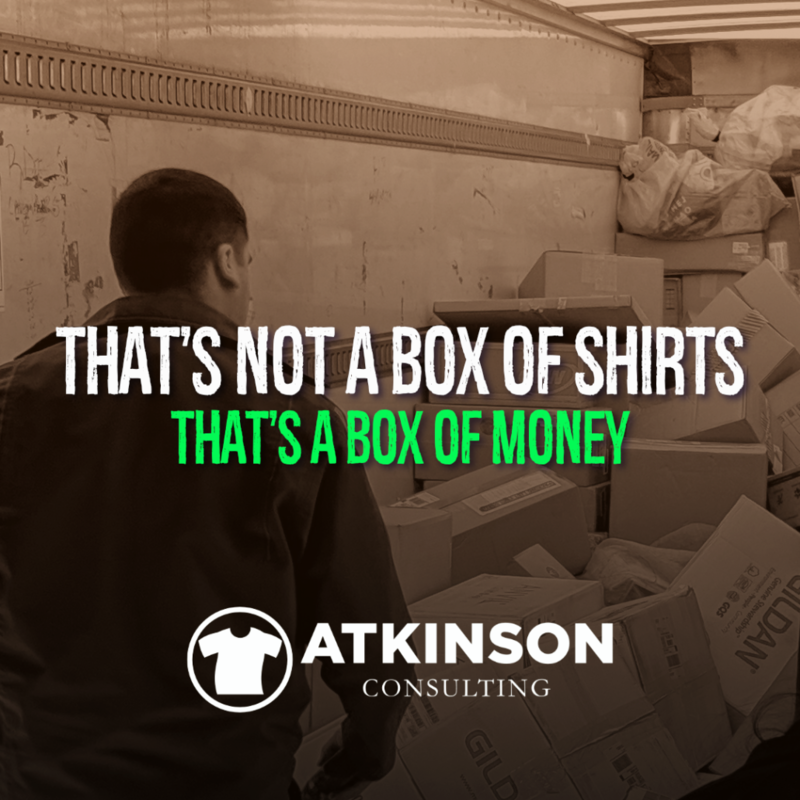 Your initial job is to go through the shirts and measure against what should be in that box. Pile through how you have these pre-sorted. After you nail down the “hot” orders, start with the single boxes. These usually are the most quantity-wise in the delivery and make up the largest chunk of partial orders too. Yep, those thirty mediums for that partial order from yesterday are in this group. One box at a time, open and check against the packing slip for style, color, size, and quantity. Have the person doing the counting initial the packing slip that they counted it and date it. Fold up the box flaps and insert the marked-up packing slip into the fold so it sticks out a little bit. Move to the next box. Review all the single boxes until you are finished. Then check each packing slip individually against what is marked in the system for that order. If your system allows it, look each up by the PO#. You are comparing what is on the packing slip and what is in the system for the order. Regardless of how many boxes were dropped off your Receiving crew needs to go through all of them the same day they were delivered. Then, print a 4″x6″ box label with the Work Order number, ship date, customer name, job name, and any other pertinent information. This goes on the upper left-hand corner of the short side of the box. If the inventory for the order is 100% complete, mark it so in the system. The box label is affixed and then it can be staged for production. If inventory is missing, print a box label, but add a big “P” for partial on it and affix the label in the same spot. The partial box is then staged with other partial orders in a special area for follow up. I like to arrange all inventory for orders by the last digit of the Work Order number. So if the number ends in a 3, the box would be staged in the 3 row. If you are stacking boxes, turn all the boxes so that the labels face the same way and all line up on the left-hand side. That way you can scan with your eyes vertically and see the grouping. It’s not an if, it’s a when. Somewhere down the line, something isn’t going to be right. Maybe the order was placed incorrectly, or maybe the distributor didn’t ship it correctly. I’ve seen a truckload of shirts that were supposed to be Royal Blue show up as Kelly Green. That’s why we are checking. Usually, the ship date isn’t going to move, so it is going to be a race against the clock to get the correct inventory sent in. Your first call is going to be to who ordered the goods. If that’s someone on your team, then it’s much easier and less dramatic to start the process of getting the correct inventory headed your way. However, if your customer ordered the goods, then it is imperative you contact them quickly. They are going to have to arrange both the new inventory and the Return Authorization (RA) Number to send the goods back. Right now, all you need is the correct stuff on the way. However, in a few days you’ll want the wrong blanks out of your way, so make sure you follow up until you get the RA. Distributors may have different policies regarding returning goods, so make sure you understand what needs to happen and follow their procedure. Let’s pretend that you didn’t do a good job of checking in the goods on the way into your shop. I know, that can’t possibly be your shop, but let’s play along. The receiving team didn’t verify the goods on the way in with the correct procedure. Production just finished and everyone is gathered at the machine scratching their heads. Nobody knows what happened. Wrong color. Sizes are different. The count is off. Whatever. If this is big enough order it could be a disaster that financially cripples your shop. Worse, is that it is completely preventable by simply implementing a procedure that sticks. That’s worth drawing the line and building in some accountability, right? Your first line of financial defense starts with your receiving team and how they process those boxes. Have you ever heard the phrase “you are the average of the five people you hang out with the most”? 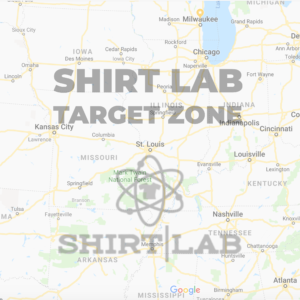 Today’s blog post was about Receiving, but I wanted to share a thought about Shirt Lab. This is a sales and marketing workshop that is designed to help you get to your next level. Included in all of that is networking with other top decorated apparel business owners. It’s a small event. Limited to 50 shops. The next one will be on March 16, 2019, in St. Louis. Raise your industry networking average. Chances are, these folks have some wisdom and knowledge that could just be the thing you need.